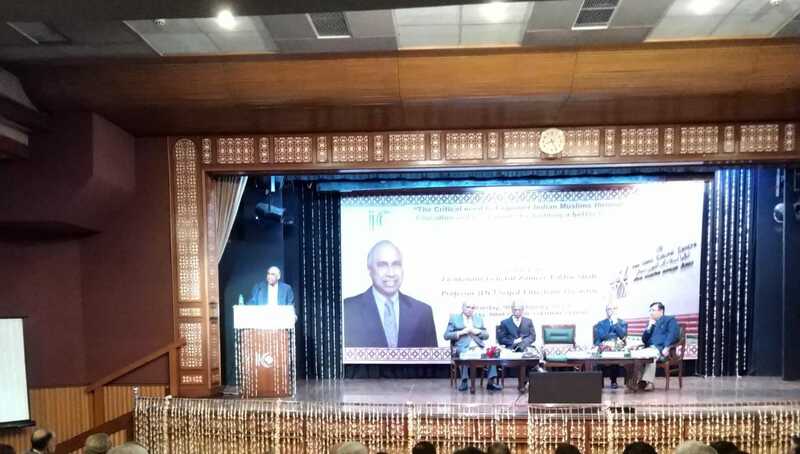 NEW DELHI: At one of the most iconic places of Delhi, India Islamic Cultural Center, New Delhi, an erudite lecture was delivered on 9th February 2019 by an Indian-American, scholar, educationist, philanthropist, business Leader, and writer of par excellence, Mr. Frank F. Islam. He has a special commitment to civic, educational and artistic causes. He believes in virtues of hard work, focus, quality, innovation and kindness. In his about an hour long speech, he mainly spoke on the importance of education in empowering any community and downtrodden people, especially, the Indian Muslims, who lag far behind in terms of education and employment in respect of other Indian communities. He said that education is a powerful equalizer and it is like a gift for the whole mankind. Only way to come out from the shackles of debilitating poverty and hardship is through quality education. It not only makes one strong in terms of earning their livelihood in a respectful and exalted way, but helps in gaining self-confidence, self-esteem and dignity. Education is the best investment one can make to create next generation of leaders, entrepreneurs, scientists, engineers and problem solvers. He has built, of late, Frank & Debbie Islam Management Complex and Frank & Debbie Islam Auditorium in Aligarh Muslim University with a vast sum around 14 crores rupees. He also duly emphasised on interfaith dialogue. He said that I treasure my faith. He also added that my faith firmly believes in equality, dignity, compassion, tolerance, justice, peace and respect for other faiths. Mr. Frank F Islam’s journey from a lesser known place in his native village in Azam Garh District, UP to the United States of America many decades back is a story of rag to riches. He, after completing his graduation from the Aligarh Muslim University had gone to the USA to realize his dream as an achiever who could hold some clout not only in the business circle, but among the political leaders and intellectuals also. The best thing to imbibe from Mr. Frank F Islam is that he has never forgotten for a single day to his motherland, India after becoming a successful person. He lives in America but his heart and mind wanders here. So far, he has financed many educational and health projects, especially, in his alma mater, Aligarh Muslim University and in his home district Azam Garh. This lecture series was well attended by many distinguished guests, mainly the other two learned speakers, Prof. Sayed Ehtesham Hasnain, VC Jamia Hamdard and Lt General Zemeeruddin Shah, ex VC, Aligarh Muslim University. The welcome speech was delivered by the President of IICC, Mr. Sirajuddin Qureshi. He not only welcomed the distinguished chief guest, Mr Frank F Islam wholeheartedly, but also spoke at length about the day to day activities of the center. He also spoke about the past legacy of the India Islamic Cultural Center and its glorious history and future endeavors. Mr. Sirajuudin Qureshi himself is a successful businessman and holds a high regard and importance among the Indian political leaders, scholars, business leaders, writers, journalists and intellectuals. The continuous activities related to the Indian Muslim culture and education is the great testimony of the vibrancy of the IICC. Vote of thanks was finally given by its Vice President, Mr. S M Khan, a distinguished media person and former Press Advisor of the former President of India, A P J Abul Kalam. He also did hold various other important posts in the Government of India from time to time as the DG of Doordarshan News, and others. Among the guests, who is who of Muslim intellectuals, distinguished life members of the IICC were also present, notably the newly elected team of Mr. Sirajuddin Qureshi as members of the Board of Trustees of the center, Mr. Abrar Ahmed, I.R.S., Abuzar Hussain Khan (Samad Khan), Ahmed Raza, Jamshed Zaidi, Nesar Ahmad, Mohammad Shamim, Sharafat Ullah, and Members of Executive Committee, Badruddin Khan, Bahar U. Barqi, Shahana Begum and Sikandar Hayat.